So we had some egg-citing news the other day which we did share with the forum but thought I should add a blog entry too. After Paula finished cleaning out all of our breeders the other day she thought it was about time she switched on the nest box cameras to have a look if anything is going on, when she did this she discovered we have 2 pairs sitting tightly on 3 eggs each Yahoo!! 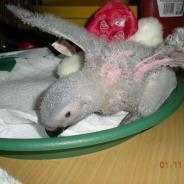 So looks like we will be hand rearing baby greys over the christmas / new year period. We expect 3 of the eggs to hatch as that pair always give us 3 babies EVERY time and strangely this always happens over the Xmas period (Go figure) … and the other pair are a new pair we put together mid year and they have only given us 1 chick so far, so fingers crossed we get at least one chick from them too. It’s blooming chilly out there these days brrr so fingers crossed the females keep their bums firmly planted over them eggs to make sure they stay warm, every time they go out of their box we watch our clocks tentatively hoping they don’t stay out too long. That’s it for now, will update as and when things progress … WATCH THIS SPACE!!! Oh anyone looking for a lovely hand reared baby grey feel free to email us on admin@african-grey-parrots.co.uk to express your interest, alternatively watch the parrots for sale section for adverts and contact us via there.